Sorry this is super short, I've just got a crazy busy schedule today with an extra full to-do list. Despite all of the crazy weather so many places have been experiencing this winter, we've had it a lot milder than usual in my neck of the woods. Heck, we're already seeing signs of springs like the crocus flowers pushing their way up through the dirt and its got me so ready for some warmer weather. And I can't help it, my cards are definitely reflecting that wish. Alrighty, I'm off to work... catch ya on the flip side! Yep, one more of the limited edition Twi Sprouts is finally taking her permanent spot on the Farm and who doesn't love that? Ya know I do! Anywho... I just think miss Ebony could give any fan boy a run for his money in a pop culture trivia contest like Beat the Geek (anyone ever watch that game show?) LOL. Hey sweeties! Are you ready for another TGF March release preview? 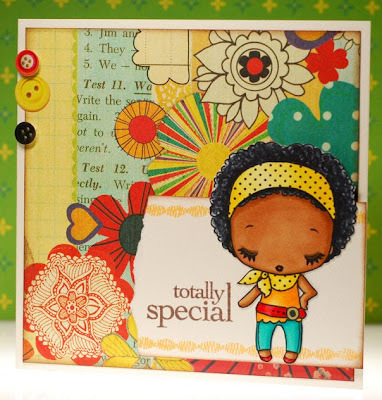 If you haven't been already, stomp on over to the CA&Friends blog to see all the wonderful cards my teamies have created with this fab new set! And then mark your calendar for Monday, the 1st when the entire March release goes up for sale in the TGF store... lots of fun new rubber to play with, yeah! Alrighty then, I'll see ya back here tomorrow with the last of the TGF sneak peeks for March. I can't wait to see all the cool cards everyone comes up with for this challenge! So we are kickin' things off today with a Wild Sprout who was super popular as a limited edition digi and is now back on the Farm in rubber... say hello to Camille! b) she has been transported into the classic Hitchcock horror movie, "The Birds"... eeek! Run Camille, run! 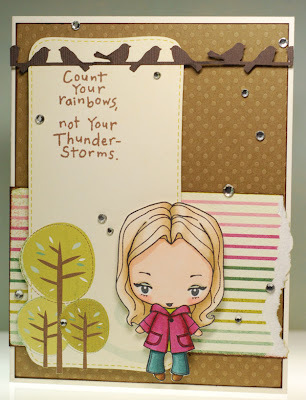 Oh and the WCW Wednesday challenge is all about embossing this week so I cheated a bit and used some pre-embossed swiss dot cardstock for the background... quick and easy! Be sure to join the fun, as always there is a shot at winning a free digi! 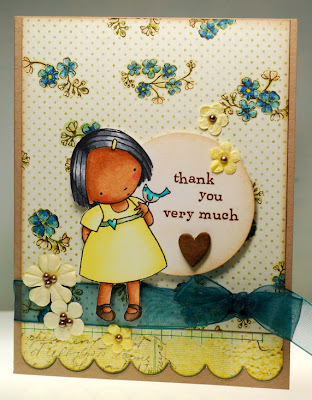 Ok, that's all I got, be sure to stop by the CA blog to see what my fellow CA gals have created with little Camille... and then I'll see you back here with more TGF goodness on Friday! So, how's everyone doing this morning? Ok take care my friends, see ya back here tomorrow with a Club Anya sneak peek! Here we are at yet another Monday morning... the last one of the month if you can believe it. 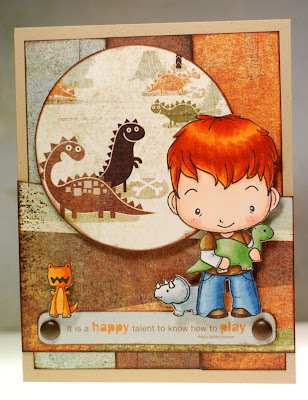 For a closer look at how I alter stamps, just check out the links I've added in my sidebar to the tutorials I've done over at Club Anya. 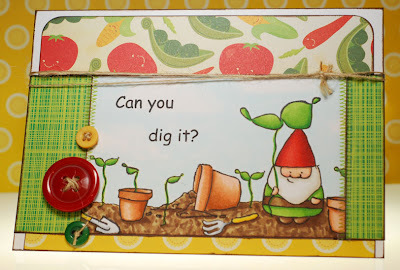 Oh and for those of you who asked how I colored the dirt on my gnome card yesterday it was really simple... I started with E55 making quick messy dots and dabs with the marker, then I did the same with E57... making the dots closer together in areas that I wanted to be shadowed (like under the pots and Mr Gnome, then I added dots and dabs of E59 in the same fashion. Once that was done I went over the entire area with smooth strokes of the E55 to blend. Hope this helps! And as soon as I spied the happy veggies paper from the Garden Variety line, the wheels began to turn. You see, my mom loves her garden, every spring she can't wait to get out there and plant all her veggies (some grow more successfully than others heeheehee) and I also knew just what stamps I wanted to use too. Alrighty, that's all I've got today... hasta manana! Sweet Saturday mornin' to ya! Okey dokey, I'm off to enjoy the day... stay classy San Diego! Before I get to today's card I wanted to let everyone know that I still haven't heard from one of the Easter candy winners yet so BJ, if you see this I need your mailing address in order to get your candy to you. If I don't hear from BJ by this coming Wednesday I'll have to draw a new winner for the Baby Bunny with bunny... I gotta do it, the clutter on my desk is getting a bit ridiculous. Bright, bight, bright, sunshiny day! Hello and good morning to you my friends! 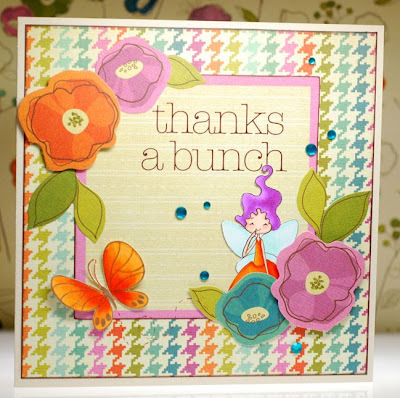 After work and a class last night I was worried that I wouldn't have a card to share on my blog today.... yikes! Luckily I remembered that I hadn't posted the cards I made for the TGF relay challenge a few weeks back so that really saved my bacon! I found this sheet of Sassafras paper in my stash and thought that the collage look of it made for an interesting background without all the work of having to create it myself... sweet! So for my first week on the team we've got a recipe challenge for ya. 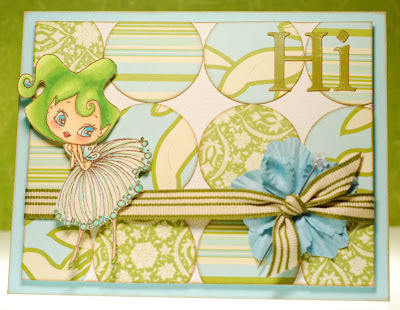 For my sample card Chanter Heartsong is making an appearance once again, my two colors are aqua and green (which, to be honest, is not a combo I use regularly), my three patterns all come from Collage Press and my four embellishments are ribbon, a flower, stick pin and alpha stickers. There is also a lot of sparkle and shine on Chanter's wings and dress but alas, I just can't pick it up in my photo... ah well. I'm dragging just a bit and have got to get ready for work so I'm gonna keep this one short and sweet. Ok, ending on a pleading note is always fun so I'll wrap things up for today. Wow! How much fun was that Cheeky Valentine hop last night?! 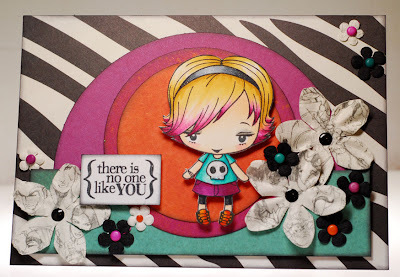 I also had fun with a bit of stamp altering... can you guess which Wild Sprouts I combined to make this sweet Valentine? Well the body is Megan's, gotta love that spunky hand on hip pose, and the head is Sassy Suzi's. I ended up giving her a bit of a hair cut to match her new spring time ensemble and I gotta say that I'm really diggin' her new flippy short 'do as a fun alternative look for her. 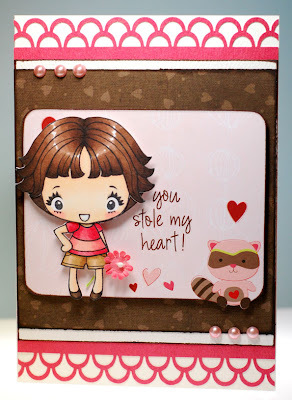 The rest of the card is pretty quick and easy, the whole little panel with the raccoon came straight from a sheet of BoBunny Love Bandit paper, which is just about the cutest Valentine's line of paper that I have ever seen! Alrighty, thanks for stopping by and I hope you get some time to rest after the big hop last night too! 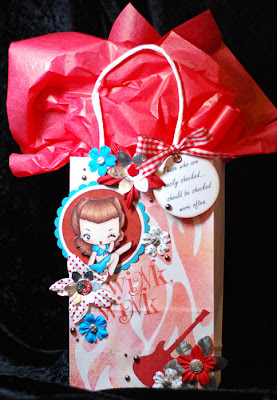 Wink, wink... it's "My Cheeky Valentine" blog hop time! 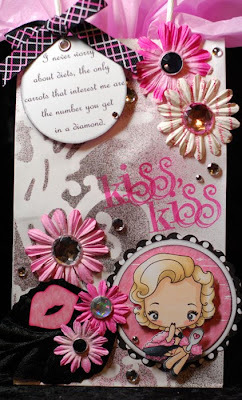 Hello and welcome to our highly anticipated "My Cheeky Valentine" blog hop! 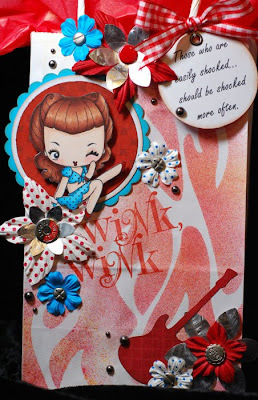 If you're not coming here from Pam's blog be sure to start at Club Anya & Friends to hop your way through the entire list of gals sharing Cheeky Cherrylicious projects today! 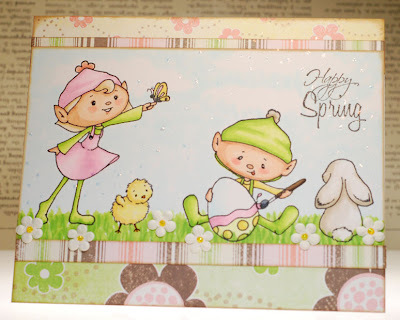 We are SO excited to finally celebrate the release of The Greeting Farm's BRAND NEW stamp line, the Cheeky Cherry Sprouts! You've seen the previews and we're so happy you agree that Rockabilly, Shooter, and Glamour have found a home on the Farm and in your hearts! Today we have a special surprise for you... the ENTIRE TGF DESIGN TEAM, both current and alum were asked to participate in this event! We are THRILLED to be back as one big team and are prepared to ROCK THE FARM tonight, so sit back, grab some tea or maybe some of that Valentine's chocolate and enjoy! Now, what would a hop be, especially on Valentine's Day, without PRIZES??? Well, there are PLENTY of them hanging around, and for our overseas friends, fear not, you will have until 9am CST tomorrow (Monday, 2/15) to enter your comments to WIN the new stamps! 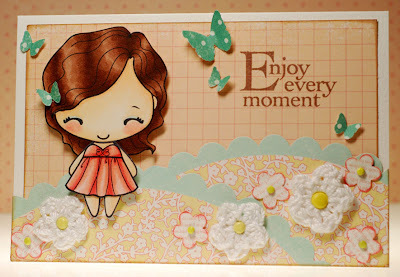 ONE GRAND PRIZE WINNER will be chosen from the Club Anya & Friends blog to WIN ALL THREE Cheeky Cherry stamps! In addition, Jessica has 'hidden' SIX Cheeky Cherry singles on certain team member's blogs, both past and present, and those winners will be able to choose which Cheeky they want to take home! That's 9 singles being given away today everyone! Can you say AWESOME?! This little Rockabilly vixen sure knows how to steam up a rowdy honky tonk and she has all those country boys wrapped around her little finger! Rockabilly is saucy and sassy and would rather down a good beer than sip champagne any day, LOL! 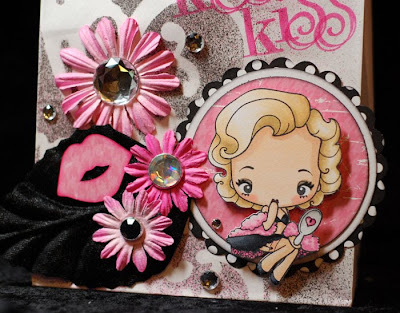 The CHEEKY CHERRY stamps will be released Monday 2/15 at 12am CST, that's in just a few hours! We anticipate that they will go fast as these sweet and sassy little bombshells have been quite well received from what we've been hearing, so scoop yours up ASAP! ALL winners will be posted on the Club Anya blog on Monday morning, shortly after the 9am deadline. GOOD LUCK! Thanks so much for participating and for stopping by today, be sure to stop by Suzi's blog now... she's the next stop on the hop! 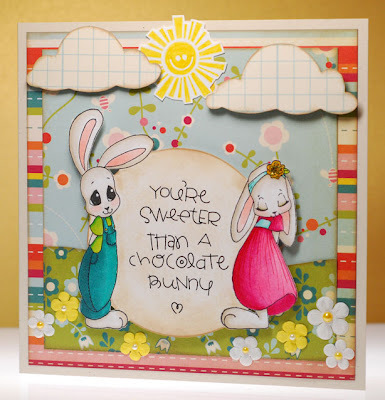 What do you say we kick things off today with a whole lot of lucky winners from this past week's Sweet November Easter release sneak peeks? And thanks so much to everyone who played along... did you know that there is still a chance to win these new stamps before they go up for sale at All That Scraps on Monday? 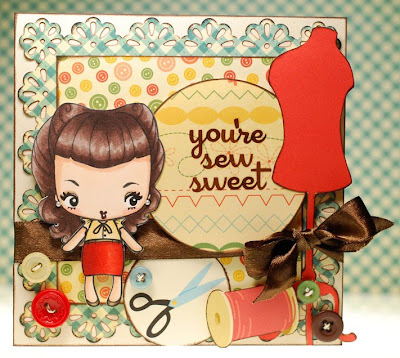 Yep, that's right... previews are going on right now at the All That Scraps blog and there is still time to get your name entered into the giveaways there so check it out! 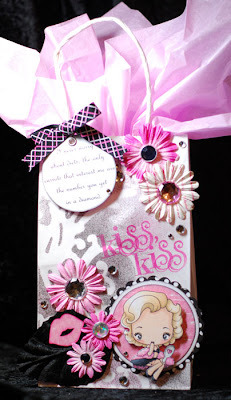 Oh and don't forget that the "My Cheeky Valentine" blog hop is starts tomorrow at 8pm cst... see ya then! Well hello there dahhh-lings... LOL! 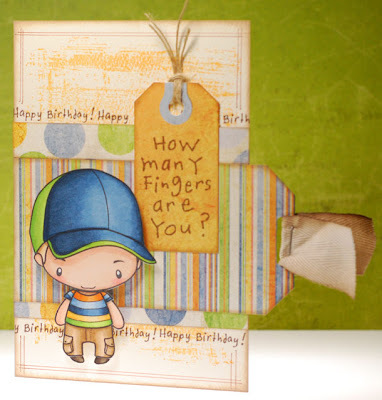 If you haven't stopped by the TGF blog yet, run on over and check out today's FFF challenge. You'll find even more Cheeky goodness there with yet another chance to win all three of these sassy sisters. For even more elvish fun and frolic head on over to Traci's and Rachel's blogs... you're gonna love what they've created with these sweeties! 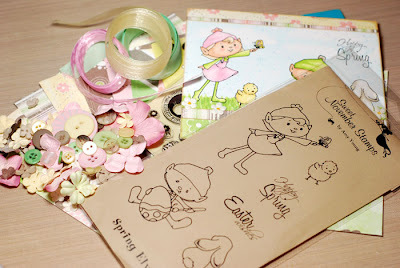 And of course there has got to be some spring inspired candy to go along with this peek so let's see what we've got today... included is: one SNS Spring Elves stamp set, nine 6x6 sheets of Sassafras Lass paper, one Basic Grey Easter mini acrylic stamp set, Prima flowers and e.line pearls and gems, ribbons, buttons, four card blanks, four envelopes and my card. If you would like a chance at giving these elves a new home before they go up for sale at All That Scraps on Monday the 15th, then all you have to do is leave a comment on this post. If you want to link this candy up on your blog that would be cool but it's not a requirement. Everyone is welcome to play as I will ship the candy wherever the winner may live. All of this week's candies will remain open through tomorrow night and I will announce the winners Saturday morning. I hope you're having a wonderful week and enjoying all of the sneak peeks my Gals and I have to share. 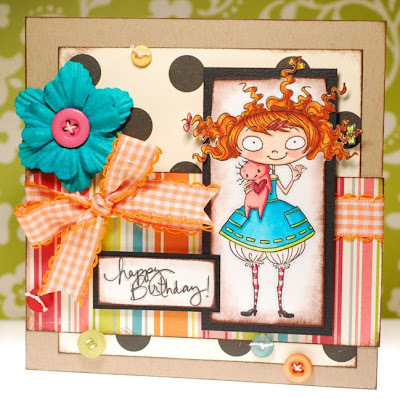 Traci and Lisa also have some super cute cards to share with you today so don't miss stopping by their blogs too! And of course we've got some candy up for grabs today... check it out! Included are TWO Sweet November Stamps, that's right, even though Peter and April are sold individually the winner will get both. 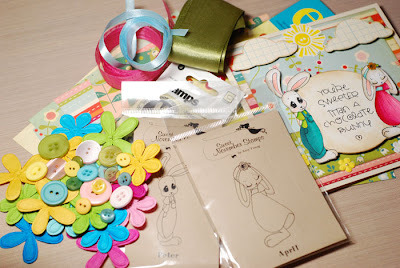 :) six double-sided 6x6 sheets of Cosmo Cricket Girl Friday papers, one Basic Grey Easter mini acrylic stamp set, Prima fowers and e.line pearls and gems, ribbon, buttons, four card blanks, four envelopes and my card. Want a chance to win? Just leave a comment on this post and if you can link the candy up on your blog that is great too but not a requirement. All of the candy posts will remain open through Friday night and I will announce all of the winners Saturday morning. Everyone is welcome to play as I will ship wherever the winners live.